March is the month when everything turns. Days are noticeably longer, the sun heats up the car and birds sing their morning love songs. 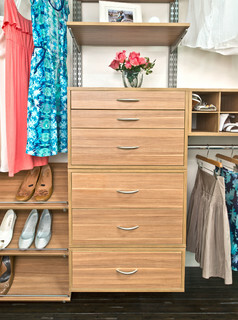 It's time to get organized at home. 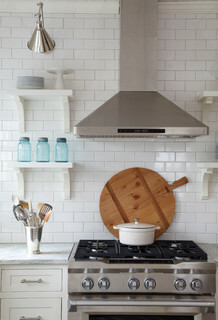 Thanks to our friends at Houzz, we've got some great ideas to share, beginning with the kitchen. This month, clear everything off the counter tops and scrub them down. Resist putting back anything you don't use every single day. Your kitchen will look larger and newer for your efforts. It's difficult to keep the "command center" desk cleared of clutter, receipts and stationary items. Buy some cloth-covered boxes to hide odds and ends, add a pretty decorative object and a plant if there's room. It's time to switch out the winter gear for the rainy days of spring. Pack away the woolen mittens and hats with moth cards from Safer. Clean the salt off boots and polish them. 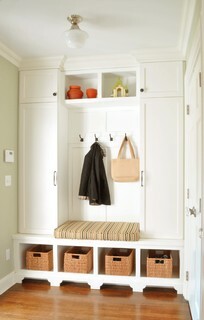 Store them with shoe forms to preserve their shape and roll up a magazine to keep the boots upright. Get the umbrella ready because those April showers that bring May flowers are just around the corner. Before you put away your winter wardrobe, take a good look at every piece. Was there anything you didn't wear once? Set it aside for consideration for charity. The rest of it can be placed outside on clothes line or tree branches for an infusion of fresh air before going to sleep for the summer. 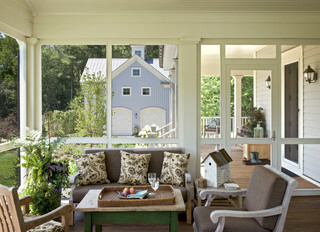 Inspect the flooring on the porch and repaint or stain if necessary. Dust the cobwebs out of the corner. Take a close look at the porch upholstery. Wipe mildew away with a weak bleach and water solution, taking care not to burn away the color. It's best to test a patch of fabric before proceeding. Clean the glass of outdoor lighting and consider replacing CFL bulbs with longer-lasting and more efficient LEDs.